The Toronto-based Meka World venture promises to deliver prefab homes to the masses. “The volume of attention we’ve been getting is beyond all expectation,” says Jason Halter. The Toronto designer might be used to garnering attention locally for the spaces and book designs he creates with partner Anita Matusevics under their Wonder Inc. label. But the love that the media has been lavishing on a prefab house he recently designed with Christos Marcopoulos signifies a whole other ball game. 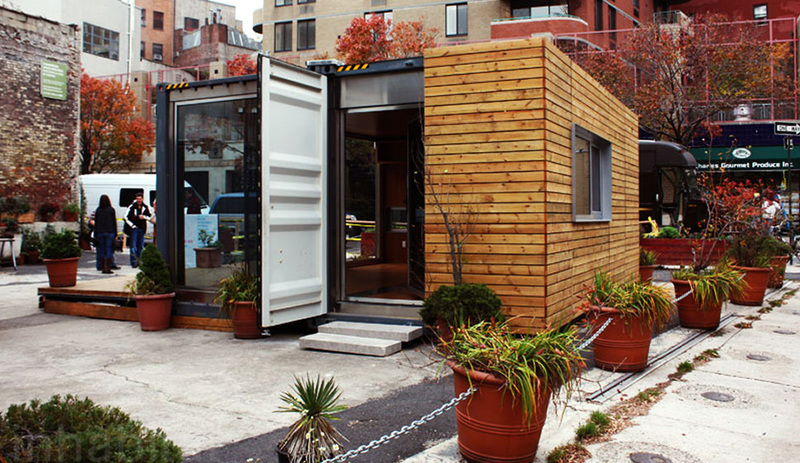 Temporarily exhibited on the corner of Charles and Washington Streets in Manhattan’s West Village, their adorable little prototype – launched under a new venture called Meka World – has caught the attention of the Wall Street Journal, BBC TV, and NY Daily News, not to mention the design blogs. Why this particular location to show off a building dreamed up by a Canadian upstart? Halter and Marcopoulos’s business partner at Meka World, Michael de Jong – the man behind the daring bike expedition Tour d’Afrique – happened to know that a parcel of unzoned land was free thanks to his friends, the owners Hub Station, a popular bike shop in that neighbourhood. De Jong’s idea to place the prefab’s manufacturing base in China is the key to the enterprise’s viability. Part entrepreneur, part adventure seeker, de Jong had first worked with Chinese manufacturers when he designed a tent built for hanging off the precipices of mountains. Cheap manufacturing coupled with a strong design sensibility would surely get this prefab project off the ground where so many other, more costly and less practical, ventures have failed. Of course, it doesn’t hurt to have a head for marketing. 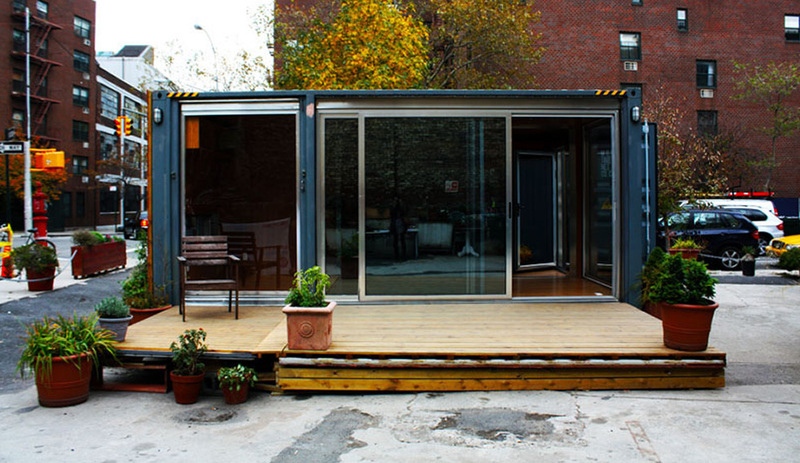 De Jong sought to get maximum exposure for Meka World from the start via his quasi-guerilla advertising idea of placing the first prefab right in the middle of Manhattan – how better to attract the likes of film producer Jon Kilick, who’s already shown interest in ordering one up as an add-on to his home. 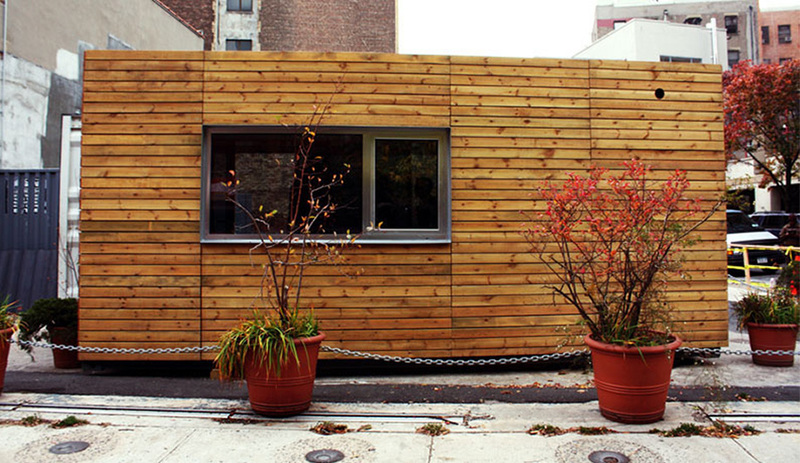 At $100 per square foot, Meka World’s four cedar-clad prefab structures (measuring 320, 640, 1,120, 1,280 square feet, respectively) are not only the domain of the elite. Each base model – with bamboo walls that are wired and insulated – is “grown” by the owner, who can opt for features like solar hot water heating, as well as source sub-zero appliances. In fact, it was affordability and sustainability that were the impetus behind the project. Clearly, there’s a demand for his new product – and not only from the press. While Halter concedes “there’s a long distance between initial connection and final commission,” he’s already fielded “three or four dozen calls” from people who want one of his cool little houses. 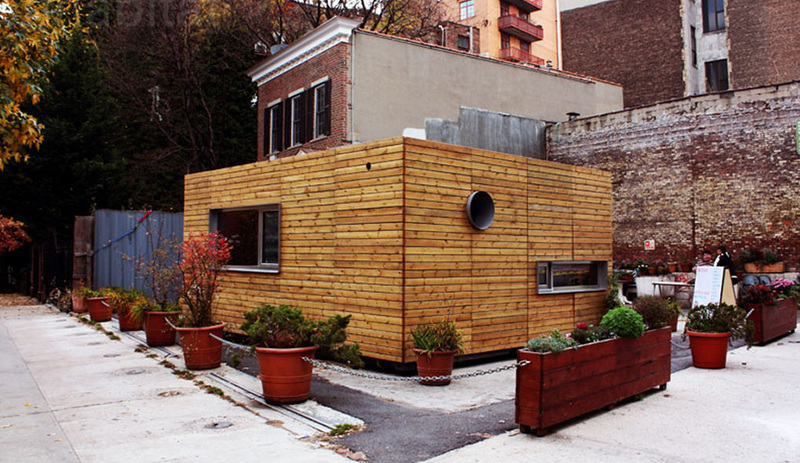 As for the one in the West Village – it’s already sold and will become someone’s private residence next spring. In an earlier version of this article, we neglected to mention that Christos Marcopoulos of nminusone architects is Jason Halter’s design partner at Meka World. Azure regrets the error.